Offers > Oracle > How is Social Changing the Way You Do Business? Oracle, Leader Networks, and Social Media Today recently conducted an online survey of over 900 marketing and technology leaders at more than 500 organizations from around the world to explore what it means to be a socially enabled enterprise. 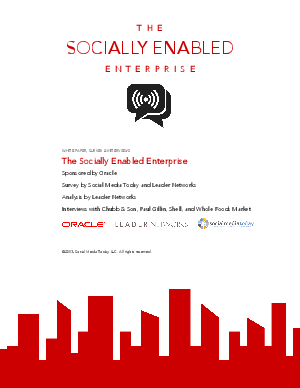 Download this exclusive White Paper, The Socially Enabled Enterprise to learn more about the opportunities and challenges global organizations are facing in the transition to becoming socially enabled enterprises.